“Our circumstances are the fuel we are given to work through to build a foundation for the collective higher.” That’s how activist-educator-artist Angel Iset Dozier explained how she uses technology to weave her Southern identity into Afro-futurist visualization and soundscapes. Hers was one of many more intentionally curated, Black-centered programming sessions at Moogfest last month in Dozier’s hometown of Durham, North Carolina, a change from prior years’ perhaps more incidental focus on minority-led conversations. This change is something organizers seem painfully aware of. One particularly heated group imagining session this year sought to visualize Durham’s potential future as a safe haven for Black excellence. In the session, festival-goers grappled with the city’s complicated legacy as the site of one of the United States’ largest plantations and the largest Confederate surrender of the Civil War, an early beacon of Black prosperity and, more recently, a city remade by cultural gentrification. Proposed solutions for the future didn’t mention inviting in a group of out-of-towners to talk shop about the latest in Norwegian electronic media, but they did stress the importance of universal cultural touchstones, like building spaces for accessible technology, and rallying in Blackness behind movements like hip hop. Such is the duality of one of the most progressive annual gatherings of artistic minds in the South. 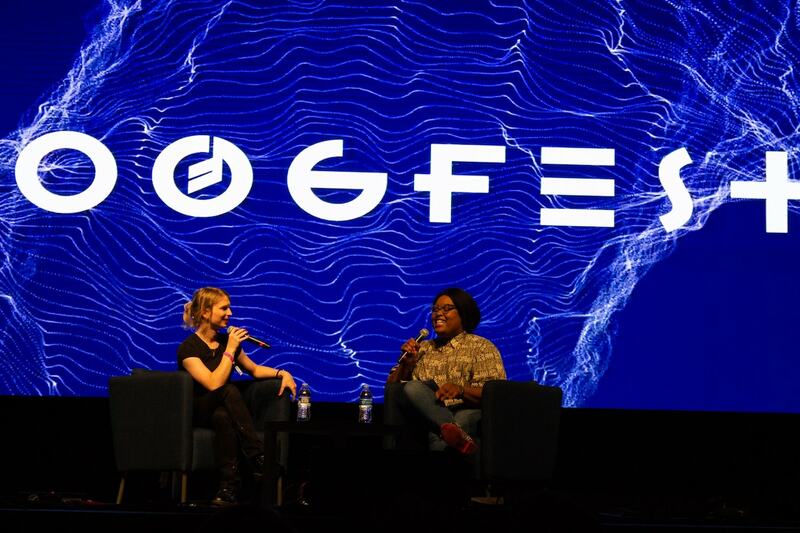 Moogfest began as a music festival in New York in 2005, then moved to North Carolina the following year, to find rapid success in its tech and future-themed programming. Since 2006, the futurist daytime lecture series has almost outgrown the nighttime concerts, and in 2016, it brought that focus to Durham. But who is it all actually for, if around 20 percent of the city's population lives in poverty? Many Durham residents cannot afford the buy-in to access the culture that festival promoters and attendees say is so crucial to Black folks, poor folks, and queer folks—the very same groups that are almost always adversely affected by gentrification. Tickets this year ranged from $247.02 to $1,556.15 for weekend passes of varying perk levels, although Moogfest has consistently remained one of the few music festivals in the area to allow full free access to locals in exchange for one eight-hour volunteer shift. A couple of years ago, Scalawag contributor Sammy Feldblum checked out the inaugural fest on our hometown streets, and mused on these uncomfortable realities. Upon leaving a party in a warehouse on the outskirts of downtown, he remarked on the contrasting—but somehow complementing—scenes of our public pride and buried shame. Grammy-nominated rapper Anderson Paak ate food truck chicken and waffles with the crowd outside. Local legends finally got their recognition in front of national audiences. A drugged-out out-of-town friend harassed a middle-aged couple in the elevators of one of Durham’s finest hotels. But the city hasn’t always been welcoming. The next year, nearly two-dozen protesters chanted the names of Black women as part of the SayHerName movement, speaking out for inclusion. This year’s predominantly Black and female contributors lineup could very well be a response to public criticism. “Organizing. Collaborating. Minding your lane. Minding your biz. Be dope together,” read another slide during Dozier’s presentation to wristband-holding locals and out-of-towners. Moogfest officials say Durham is “among the fastest growing and most exciting cities in the country, built on a unique blend of diversity, authenticity, world class innovation, and culture.” This year seemed to strike a precarious balance, showcasing outsider innovation but better respecting the racial and socioeconomic accessibility of the city the Moog brand has found itself gentrifying as a result. The struggle for that balance was exemplified in both programming and music. This year presented a mixture of local and global acts, and brought in some $200,000 in tax revenue for the city. The festival added nearly $7 million added to the local economy. “Organizing. Collaborating. Minding your lane. Minding your biz. Be dope together,” read a slide during Dozier’s presentation to wristband-holding locals and out-of-towners. And the city was indeed, for three nights, dope together in sweaty, rain-drenched dance halls, late into the night. But only time will tell if that precarious balance will reach a tipping point next year. Lovey is Scalawag’s engagement editor.